Another Atrocious Refereeing Decision Can Do Nothing To Derail The Celtic Machine And Timothy Weah. When title winning teams look back over the long slog of the campaign, it is days like these which stand out clear and bright. When title winning sides are contemplating the turning points to find the moment when they could see the end in sight it is this kind of match that comes to mind; we’re moving towards the final stretch of the campaign, when things are won and lost, and we’ve gone to a tough ground and in difficult circumstances left with three points. These are the days which win titles. Earlier in the week I said that the next three away matches will be crucial. With a six point lead and a hefty goal difference – only slightly reduced by Andrew Dallas’ largesse yesterday – the fixture list has thrown up a danger and an opportunity; three tough away matches in the space of five or so weeks. Today was the first. It has been successfully navigated. Two remain, at Kilmarnock and Hearts. Based on our splendid home form, if we win those it’s our title to lose. Before I begin, one thing on the refereeing; after yesterday I expected something horrendous. The tackle on Edouard was atrocious, and merited both a red card and a penalty kick. Andy Walker’s frankly embarrasing statement that outside the box it would have been a foul but that it wasn’t a spot kick should see him drummed off of Sky whilst they have customers left. It was the sort of challenge that would have been outlawed in Rollerball, a high lunge with the studs up. Frankly, if it’s not a penalty then nothing is. Until our club starts forcefully responding to such incidents, we’re going to keep on being on the wrong end of them. This was a huge result today, and a huge performance, especially in that last fifteen minutes. The team had just lost Odsonne Edouard to another injury, shortly after he came on. That did two things, both of them bad. It deprived us of our best striker and it reduced to zero the manager’s room to make a further tactical switch. The decision had to be perfect, and the substitute had to find some magic. The manager did his bit, tweaking the formation slightly to bring Sinclair and Forrest in a little deeper. The rest was down to Timothy Weah. He delivered, big time, and his quality is now apparent to even the harshest cynic. For all the hype that was generated by a certain signing across the city, it was clear from their first game that Burke and Weah were far better options. Indeed, based on that astonishing fifteen-minute cameo Weah might be the steal of the century. If we can keep him for another year beyond the current term of his loan he will light up the SPL next season like few others have. We are watching the growth and development of one Hell of a player. What a pleasure it is that he is coming on so well in our famous hooped shirt. The positives from the game are obvious; two of our new signings have established themselves in the team and look like they will make a difference. Burke was quiet today, but he is playing out of position at the moment, but he contributes so much and works tirelessly. Weah is lightning in a bottle. With Burke on the right and Weah through the middle in midweek we’ll see both at their best, and I expect they will run riot against a Hibs defence not remotely ready for them. Toljan had a composed debut today, and looked very alert and strong. He will be a significant player for us in the remainder of this season. Given a chance to extend his loan or buy him outright, I think we’ll have an easy decision to make with him. His pedigree is first rate. He can be huge for us in the quest to make it eight in a row. Only Bayo has a question mark against him, and only because we’ve yet to see him in the colours. That will come soon enough. If he is as good as the likes of Lubo and Toure say then we’ve got another very fine footballer. The window has definitely improved us. Before it opened, would we have won that today? Lustig went off at half time and we could not have adequately replaced him. Up front, we might have thrown Edouard in half fit, or gone with Mikey Johnston up front, and been poorer for it. Burke led the line in the first half and when Odsonne went off we had Weah to bring on. The hacks who questioned our decision to focus, early in the window, on the final third didn’t see it but Brendan did. Those who suggested that we should have gone with experience like Defoe … ha! Defoe won a penalty yesterday and got an assist. He scored from the spot. At home, against the bottom club in the league. He no longer has the legs or the alertness for that splendid move today which opened the scoring, where Weah collected the ball beautifully, drifted left and sent it into the box. He would not have been able to produce the run, pass, run and collect for the second. 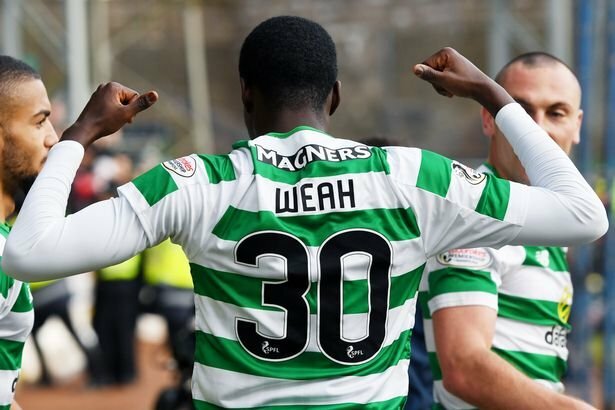 That was a big day in this title race, and at just the moment when we needed a real talent to show up for business and produce, Timothy Weah stepped up. He did it with a smile, with a real pleasure in the simple joy of playing the game. You can’t buy that. But we were able to get it on loan. We’ve taken a big step towards the title today.